CAST Highlight is a product of CAST, the market leader in Software Intelligence. CAST technology helps digital leaders and doers see the truth, become software geniuses and deliver super software - resilient, responsive, safe and secure software. Hundreds of companies rely on CAST to improve end-user satisfaction and time-to-market, prevent business disruption and reduce cost. Founded in 1990, CAST operates globally with offices in North America, Europe, India and China. MEGA International is a global software firm helping companies manage enterprise complexity by giving them an interactive view of their operations. Executives gain the visibility and information they need to make the right choices for effective governance and to strike the right balance between capacity for innovation, cost optimization and risk management. Backed by HOPEX software and MEGA consulting services, companies can boost business and IT agility in today’s disruptive business environment. 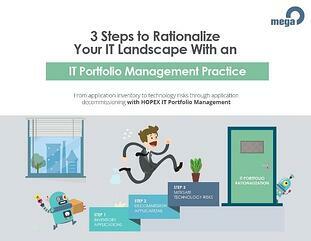 MEGA’s HOPEX ITPM and CAST Highlight’s Integration bring the necessary objectivity & visibility to handle Advanced IT Rationalization to reduce cost & complexity, Cloud Migration to gain more elasticity and accelerate innovation at scale and IT Health & Risk Assessment to keep your Portfolio Healthy & Secure over time. 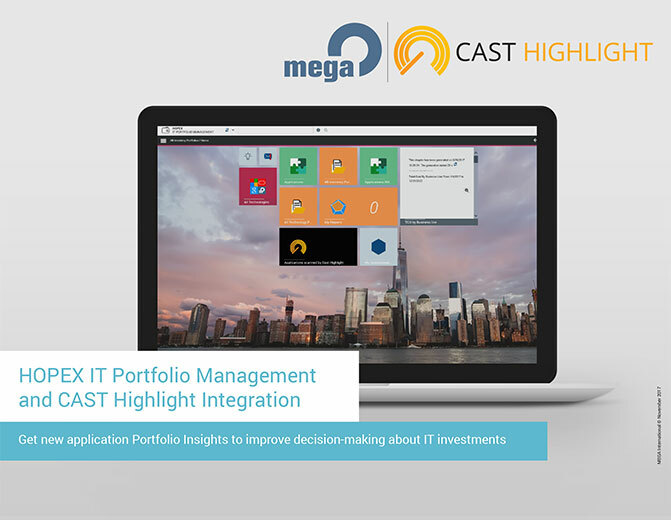 Get new application Portfolio insights with the integration of CAST Highlight into MEGA’s HOPEX IT Portfolio Management solution. Bring additional value to your organization and help move from a simple – but yet beneficial-application inventory to full management of your IT assets.